The Malaysian government has made a sweeping reform to its tax system, abolishing, and replacing, GST - what do you need to know? In May 2018, Malaysia’s Ministry of Finance announced that Goods and Services Tax (GST) would be abolished - and replaced by a reintroduced Sales and Services Tax (SST) at an as-yet unannounced date. The change to the tax system is part of a wave of economic reforms promised by newly-elected Prime Minister, Dr Mahathir Mohamad, who came to power dramatically by ousting the Barisan Nasional coalition, which had ruled the country for 30 years. 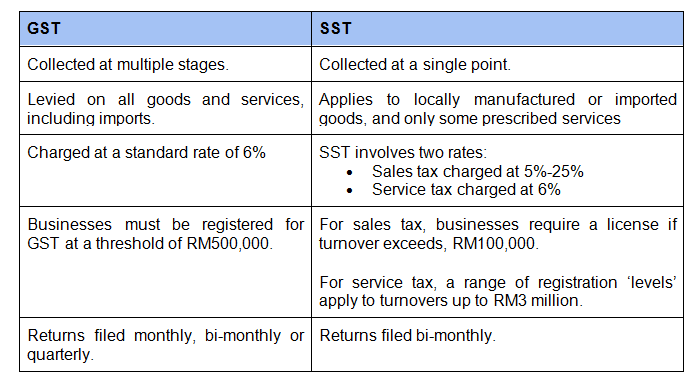 How will the change from GST to SST take place? Although no firm date has been set, Dr Mahathir has stated that SST will be implemented in September 2018. Until then, a transitional arrangement will be in place to help businesses acclimate to the new environment. The first step of the transition began on 1 June 2018, when GST was adjusted from 6%, to a 0% rate across Malaysia. How should my business handle GST during the transition? Despite its adjustment to 0%, GST has not (yet) gone away. In fact, during the transition period, GST still applies across Malaysia under existing regulations - but at a rate of 0%. This means that businesses must continue to process and report GST, and fulfil all compliance requirements - including registering for GST, issuing invoices, using correct tax codes, and submitting tax returns. How should I process GST invoices? Invoices from 1 June onward should be processed at the 0% GST rate, while those from May and earlier, should be processed at 6% GST. From 1 August 2018, all 6% GST taxes will be deactivated, since submissions for May 2018 will be complete, and quarterly submissions will be complete by July 2018. How should I prepare for the transition? Impact: Explore the effects of the 0% rate GST on your business’ prices, contracts, and administrative processes. Timeline: Develop a timeline and roadmap for STT implementation in your business. Communication: Ensure employees and stakeholders remain informed throughout the transitional phase. Recalculation: Adjust for the 0% GST charge and recalculate selling prices accordingly. Your customers should also be notified of the change - and informed that prices will change again with the introduction of SST. Training: Your payroll employees should be trained and ready to handle the administrative challenges of SST transition and implementation. For more advice and insight on Malaysia's tax system, browse activpayroll’s dedicated Malaysia Global Insight Guide.